Millennials have been described as digital natives, generation rent, gen Y, a mystical group of mobile maniacs who will take over 10 pics just to ensure their selfie is ‘on fleek‘ (flawless, perfect, spot on). Either way, millennials are a large and influential consumer group, especially for marketers. But the key is for marketers to realize that millennials are doing the exact same things that the previous generation did, but they are doing those things differently. Take TV as an example, millennials, like the generation of movie-goers before, love a great series or movie, the difference is that they view them online,on demand and expect them to be supported by an ecosystem of content. For example, the blockbuster sequel to Independence Day invited younger audiences who had not seen the first movie to experience and interact with a fictional website describing “The War of 1996”. Millennials enjoy and are influenced by music just like their parents and grandparents, only the format is not fixed to vinyls, cassette tapes and CD’s. Music isn’t bought and stored on shelves, instead, music is stored on mobile devices , shared across platforms and only accessed short term. The list can go on and on and extend to shopping and even social consciousness. The same goes for email, it’s not about whether millennials use email or not – they do, it’s just that they use it differently. 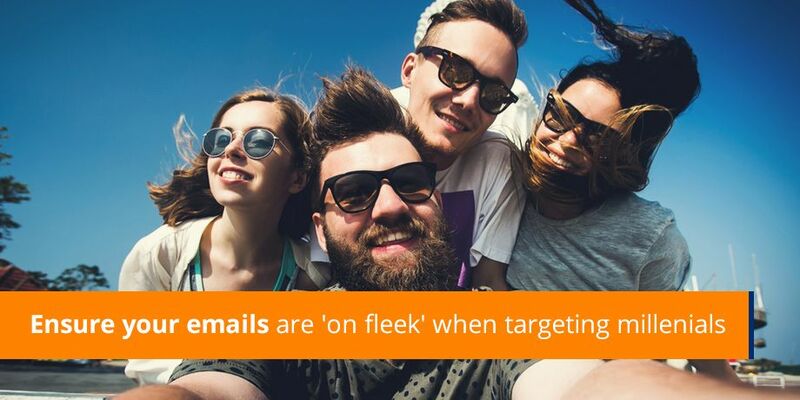 Email is a perfectly positioned channel in the digital economy but to avoid a swipe to the trash, email marketers must change up the formula and do email differently when targeting millennials. Studies have shown that millennials are more mobile and more frequent users of email than any other age group. Design emails with progressive enhancement in mind to allow for a mobile experience that will encourage interaction and best showcase the content. Ensure that all the campaign elements are responsive to allow for a seamless experience irrespective of device. Social media is important. It is almost a default digital channel for millennials. Include social proof in product related emails, or adding share functionality to share worthy content in email marketing campaigns could increase engagement, extend the life of your content and move the subscriber further down a purchase path. Dale Carnegie said “A person’s name is to that person, the sweetest, most important sound in any language… Respect and acceptance stem from simple acts such as remembering a person’s name and using it whenever appropriate.” Personalization is best practice but this is particularly true for millennials, who at times, choose technology over personal encounters, but crave authenticity and ‘realness’ from a brand. The human attention span is only about 8 seconds. Millennials tend to expect instant gratification, they expect response or results at the speed of touch. Ensure that email campaigns are supported by custom backend functionality that allows for quick and easy forms, fast response times, immediate triggered replies. Millennials are digital natives and expect that technology just works. Ensure that your email marketing campaigns are well tested and 100% correct. Content, functionality and rendering must all be perfect. Is your email strategy future friendly?